To enable the autocompletion feature for the current session just click on the Start button. As soon as you start typing a context box will popup that gives you suggestions. Arrow Up/Down: Move the selected index in the arrow-direction. Page Up/Down: Same as arrow keys but skips a fixed a few items. Home/End: Jump to the first or last element. Wheel Up/Down: Move the selected index in the rotation direction. This only works when the mouse is on top of the context box. Use TAB/ENTER to insert the currently selected suggestion. Left click on a suggestion will insert it too. The Jedi library is not always fast. Particularly when it scans a new module it can take a second. After that it should be faster again. 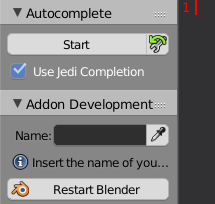 If you don’t want these slow downs you can turn Jedi of by disabling the Use Jedi Completion property. Fortunally, the Jedi library is not the only Completion Provider in this addon. You will still be able to autocomplete words that already exist as well as the bpy.ops operators.